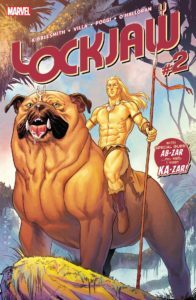 Lockjaw and D-Man excellent adventure continues in this second of a four part series from writer Daniel Kibbelsmith and artists Carlos Villa, Roberto Poggi and Chris O’Halloran. Lockjaw’s dogo senses have been tingling, something not quite right is afoot and he is intent on finding out what is going down. The first step in his journey was to Brooklyn where he met up with Bixby, a friendly pupper who is reportedly thirty years old and in (as it turns out) Lockjaw’s brother! Lockjaw had arrived just in time to rescue Bixby from a marauding swarm of miniature flying saucers piloted by intelligent hamsters. With the aide of the retired hero and one-time Avenger, D-Men, Lockjaw was able to repel these sinister hamsters and successfully protect Bixby. Yet there was no time to rest, if one of Lockjaw’s siblings was in danger then it stood to reason the others may be in peril as well; and Lockjaw dashed off. D-Man tagged along, not realizing Lockjaw’s particular pedigree and teleporting powers. Before he knew it, D-Man found himself transported to the prehistoric Savage Land, where the two appear in front of Ka-Zar, protector of the jungle, and his trusted sabertooth tiger ally, Zabu. Ka-Zar and D-Man do not know each other, but the nonverbal interactions between Lockjaw and Zabu make it quite apparent that they are allies not threats. Still, the Savage Land is a dangerous realm, filled with all manner of dinosaurs, predators and prey. It’s no place to just dally around, so Ka-Zar brings the foursome back to his and Zabu’s shelter. Prior to this unexpected foray with Lockjaw, D-Man (aka Dennis Demphry) had been rather down in the dumps. He had lost his super powers, broke up with his boyfriend, and has felt vert adrift in life; listless, lacking in purpose and more than a little depressed. It turns out that Ka-Zar of late has been feeling a bit shiftless himself. Lording the Savage Land is hard work, yet the repetitive nature of it all has kind of gotten him down. 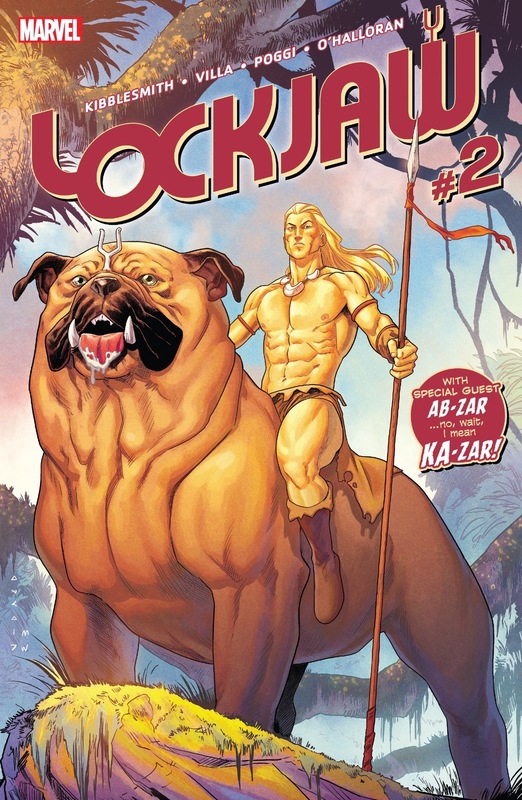 Tracking, hunting, fighting dinosaurs, eating… rinse and repeat… Ka-Zar has come to want more in his life, something new. And hence he has tried his hand at farming. He’s terrible at it. Ka-Zar’s main crop seems to be some sort of cabbage filled with worms. It’s pretty gross, but Lockjaw is more than happy to have his share and seconds. D-Man asks if Ka-Zar might try his hand at livestock. This he had attempted, penning a heard of gazelle. Alas his whole heard was slaughtered by ‘the Great Beast’ and its horde. As if on cue, a terrible howl bellows through the land. The Beast and its pack is upon them, giant wolves that quickly surround our heroes. A battle ensues. Ka-Zar, Zabu and Lockjaw are adept at battling giant wolves, but this is sort of a first for D-Man. He feels quite vulnerable without his former superpowers… yet he was once a professional wrestler and manages to use an old judo moves fend off one of the wolves. Still, the foursome is outmatched by the pack. The attack comes to a sudden halt as the Great Beast, the alpha who leads this pack comes walking onto the scene. This ‘Beast’ is not another wolf, but rather a rather cute little bulldog that carries herself with the utmost in confidence and poise. Quite clearly it is Lockjaw’s sister; and unsurprisingly she’s a total badass. Lockjaw and his sister commune in their unspoken dogo fashion. Whatever warning and information Lockjaw has come to deliver may be unnecessary. His sister produces the wreckage of one those menacing flying saucers. It would seem that the villainous hamsters had come for her as well, but she was not as easy a target as Bixby. The Beast and her pack had made quick work of the invading saucers. She is not in need of her brother’s protection… still, it’s clear that the two siblings are happy to see one another. Yet there is work to be done. 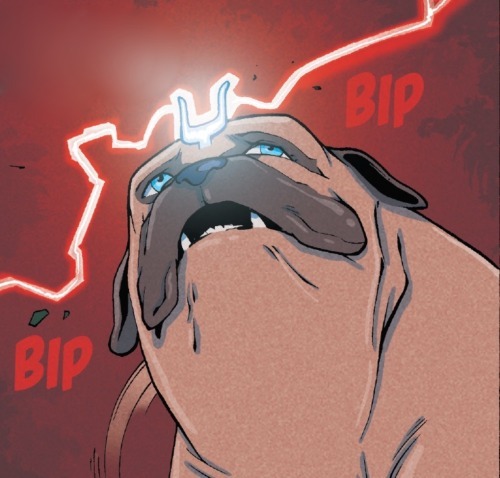 The firs two of Lockjaw’s siblings are safe, but he is no closer to discerning the origins of this threat and the strange beacon that has been calling out to him remains a mystery. It’s time to return to the chase. Saying their goodbyes, Lockjaw and D-Men teleport off to places unknown, leaving Ka-Zar and Zabu bit mystified over all that had happened. 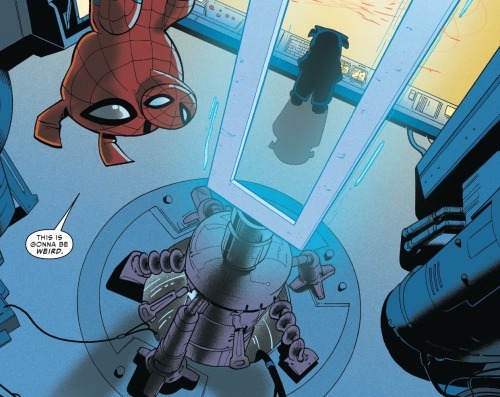 Elsewhere, The Amazing Spider-Ham (a piglet version of Spider-Man from an alternate universe populated by anthropomorphic animals) has been monitoring a dire threat. He and his unseen colleague are clearly quite worried over some unknown threat and have been desperate to beckon Lockjaw to their realm. Somehow, Lockjaw is the key to plan to save everything. They’ve constructed a beacon shaped much like the Inhuman glyph tuning-fork… it seems to be meant to lurer Lockjaw to them. Whether or not they will succeed and the mystery of the terrible threat Spider-Ham needs Lockjaw’s aid will have to wait to be revealed, fore the issues comes to an end with the promise of continuation. Another fun ride and terrific follow up the wonderful first issue of this series. D-Man, with his depressed, existential crisis, had been the unexpected heart of that first issue. 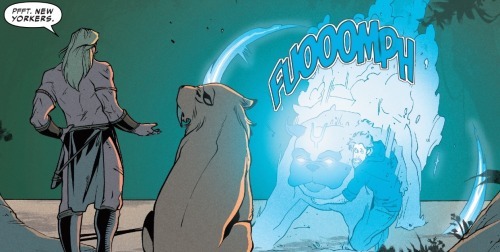 Though he gets much less time to wallow in his angst, he plays off really nicely with Ka-Zar; who himself has arrived at something of a transitional crisis. For many, the path of life and development can seem quite clear. You grow up, go through education, get a job, get married, have children, raise those children, get old, et cetera. This path works for a lot of people, but not everyone. And for those for whom the path isn’t for them, adulthood can come to feel quite like something of a savage land, a frightening realm that’s quite difficult to navigate. Despite his chiseled body, incredible good looks and impressive capabilities, Ka-Zar is coping with many of the same problems as Dennis. Having adventures and fighting dinosaurs was fun in his youth, but now he yearns for the next step and isn’t quite sure what that next step is. He’s tried farming, but is terrible at it and the various threats of the Savage Land has made it quite difficult. 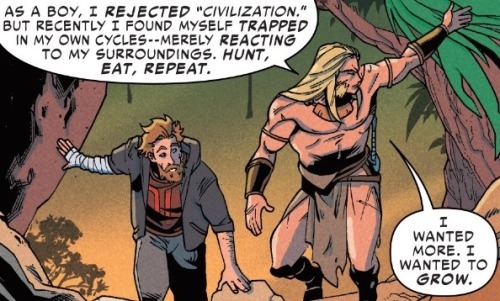 Dennis and Ka-Zar are kind of in the same boat; two men heading toward middle age with no clear path of how to get there; no roadmap to show them the way to fulfillment. Yet whereas Dennis had taken to this crisis by wallowing in his sorrow, in a darkened apartment, watching gameshows and eating cold pizza, Ka-Zar had taken a different approach. He tried new things, sought out something that might bring him fulfillment. Yeah, he sticks at farming, but at least he tried… he’s put in the effort to find that thing, to discover a new path. It’s a lesson that doesn’t seem lost on Dennis. Granted, seeking out one’s path is frequently easier said that done. Dennis is a rather depressed guy and one of the many hardships of depression’s is that it can completely sap a person’s energy. Getting out there and trying to find what it is that will make you happy is a near impossible task when simply getting off the couch feels a herculean effort. Still, it was likely heartening for Dennis to see a veritable adonis like Ka-Zar coping with a similar plight. Although this ‘path’ in Dennis’ case may seem illusive to him, for us readers it may appear rather evident. He is not ready to stop being a hero. Powers or not, Dennis still wants to be a hero, to have adventures and make a positive difference. This is his path toward actualization. he wants to be D-Man… not ‘D’ as in depression, or dysthymia, dimwit, or even demolition. D as in determined, daring and destined for greatness. And Dennis steps up when Ka-Zar decides that the savage Land is no place for farmers; it is a realm of hunters. He picks up his spear ready to fell one of the wolves as it walks away. Dennis intervenes, preventing Ka-Zar from spearing the animal in the back. The Savage Land may be a realm of kill or be killed, but Dennis is not about to sit back and watch a defenseless animal taken down from behind. 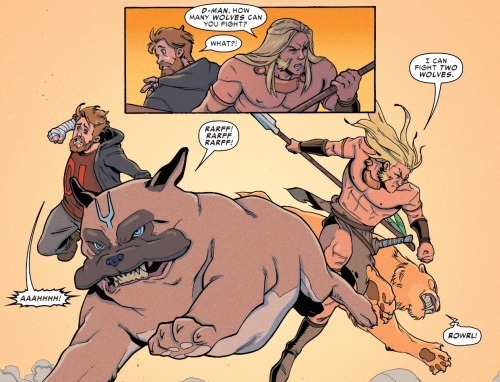 Preventing Ka-Zar from doing so is what heroes do… Dennis’s ‘path’ is to be a hero; and it is quite possible that his adventure alongside Lockjaw is just what he needs to accomplish this task and find that path and become the hero he needs to be. Again, the art, inking and colors are top notch. Villa and company excel at depicting the Savage land with the same verve and dynamism as they had Arctillan and Bushwick, New York. It’s quite a testament that these artist can jump around such a variety of setting and not miss a beat, maintaining a visual continuity despite the great differences in settings. Villa’s knack for depicting facial expressions continues to pat off. Dennis’s sense of awe over Ka-Zar’s physical beauty is evident, as is Ka-Zar’s feeling perplexed Dennis’s civilized values. And I love the joke that everyone from the outside world that Ka-Zar meets is always from New York. Likewise, Villa and company illustrate a wonderful Lockjaw, toeing that tiny line between cute and ferocious. 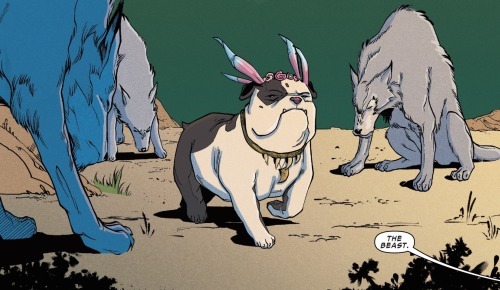 The introduction of Lockjaw’s sister was the highlight of the issue. Seeing this little pupper saunter up as the alpha leader of the giant wolf pack was both hilarious while making perfect sense. Of course Lockjaw’s sister is this ‘beast’ and leader of the wolf pack… she’s Lockjaw’s sister… what else would she be doing? While the issue offers up a fun and thrilling adventure, it doesn’t offer much in the way of clue regarding the overarching plot. There’s still no breadcrumbs indicative of what it is that has Lockjaw’s siblings in peril. Although I suppose that is likely to be made evident int he next issue which looks to see Lockjaw and Dennis traveling to another universe where they’ll team up with the amazing Spider-Ham. Definitely looking forward to that. Once more, lots of fun and highly recommended. Four out of five lockjaws.